Doncaster Rovers hope to end their Walsall hoodoo this weekend. The Saddlers have won the last seven meetings between the two sides. The Bescot Stadium was also the scene of Rovers’ worst performance last season when they slid to a woeful 4-2 defeat. 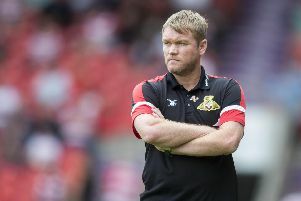 Rovers boss Grant McCann said: “The boys who played there last season will be drumming that into the group, without me saying too much about it because it’s in the past. As is the Luton game last week. “We’ve got to re-focus and be ready. “What happened last season happened. “It’s never an easy place to go to anyway. “But I know the record for this club hasn’t been good there. Walsall, tipped by the majority of pundits to be among the strugglers this season, are one of five teams still boasting unbeaten records in League One. “I’m not really surprised by how they’ve started,” said McCann. “I saw what Dean [Keates] did at Wrexham. “He’s had to re-jig things. He lost some good players; Bakayoko, Oztumer, to name a couple. “He’s replaced them with good quality in [Andy] Cook and [Morgan] Ferrier. “We know it’s going to be a tough game. “But we have to make sure we go there and stamp our authority on the game. “We’ll worry about us, as we always do. Rovers have no new injury worries ahead of this weekend’s game. Midfielder Ali Crawford is set to return to training on Monday after six weeks out with a knee injury.